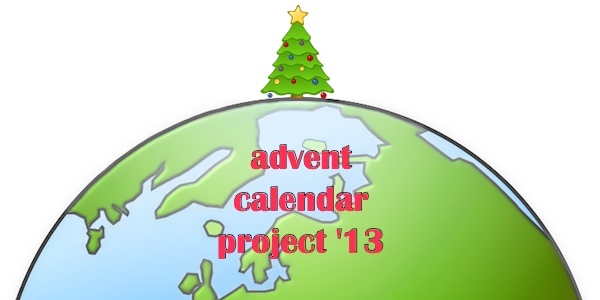 This week we are headed to Spain, more specifically the Catalonian region, for our Advent Calendar ornament. I have to say that I think this is the definitely the strangest, but definitely the most fun, ornament of this project so far. I give you Tió de Nadal also known as the Pooping (or Shitting) Log. 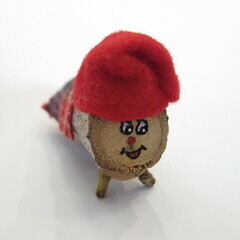 The tió traditionally is just a hollow log usually about a foot long. 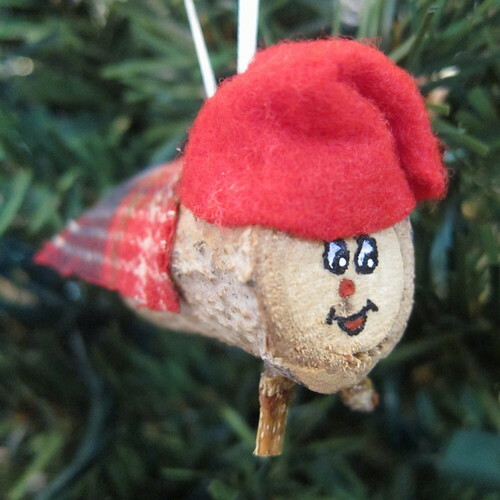 In more recent years, the log has gotten a face painted on it, two front legs to stand on and a red stocking cap. Starting on the Feast of the Immaculate Conception, children give the log a little bit to eat every night and cover it with a blanket so he won’t be cold. On Christmas Eve or Day, children go and pray for the log to bring a lot of presents. While they are out of the room praying, parents hide small gifts like candy, nuts and dried figs under the blanket. The children return, the log is put into the fireplace (if the home has a fireplace) and ordered to poop. 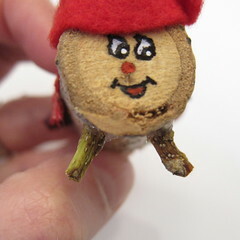 To help make the tió poop, it is beaten with a stick while songs of Tió de Nadal are sung. 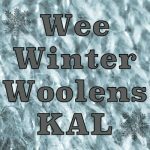 There are lots of different songs, but here are two versions I found on Wklipedia. que són més bons!” which are much better! With the words “caga tió” the log is hit hard and someone reaches under the blanket to remove a gift. This continues until the tió poops a herring, onion or head of garlic meaning there are no other gifts left. Gifts from the tió are meant to be shared with bigger personal gifts coming from the Three Wise Men. So, let make our own miniature Tió to hang on the tree. 1. Cut the branch into a piece about 1 1/2″ inches long. Sand the cut ends smooth. 2. Paint a face on one cut end. I drew my face on with a pencil and then went over it with a fine point Sharpie (I checked first to make sure it wouldn’t bleed on my wood.). Then I added details with the paint using toothpicks instead of a paintbrush. Let dry. All the pictures I found of Tiós online had a red nose and a big smile. 3. 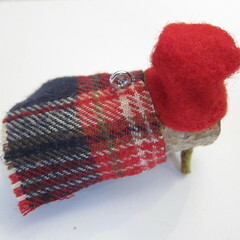 Make a small stocking cap from the red felt. 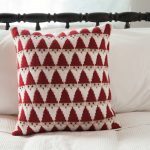 Do this by cutting a triangle that is approximately 1 1/2 inches on all sides with the bottom side rounded off. 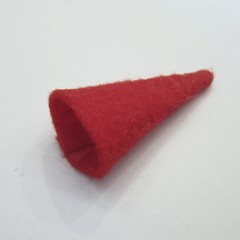 Glue or sew the triangle into a cone. I found it easier to sew. 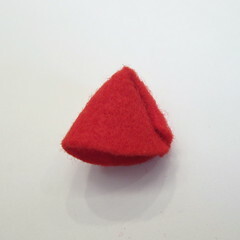 Then fold the point down over the seam and sew or glue into place. Glue on to the tió’s head. 4. 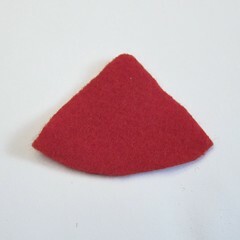 Cut a small rectangle of fabric or more felt just big enough to go over the tió’s back. Poke the screw eye through the fabric and screw into the tió about mid-length. Glue the edge of the fabric down. 5. 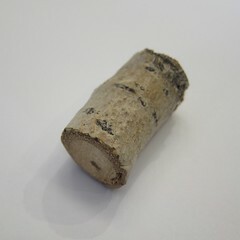 Cut two small pieces of the twig, about 3/8″ long. 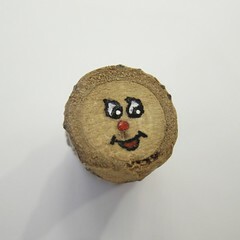 Glue to the bottom of the tió just slightly back from the face. Let dry. 6. Put the ribbon through the screw eye and tie into a loop to hang the ornament. This actually made me laugh out loud–as in guffaw. I had never heard of the this tradition but leave it up to you to find it. Well done, all around.